I’ve been sending emails back and forth with some folks about different ideas for backyard pond and water feature ideas. The result is this very nice guest post. Enjoy! There’s good reason why people seek out the ocean, rivers and lakes: the flowing water is just simply relaxing. Just a trickle of water is enough to soothe the mind after a stressful day. 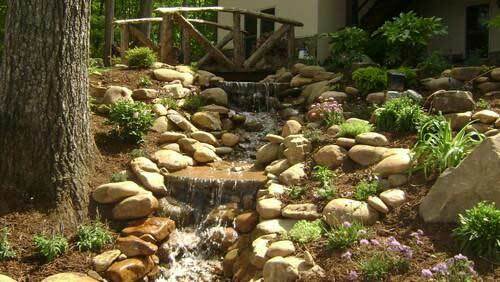 To go a step further, many decorators try to incorporate backyard water features to keep that calming sensation alive. From an inexpensive fountain to a full-blown pond, these wet ideas are sure to inspire you to install a water feature in your own backyard. 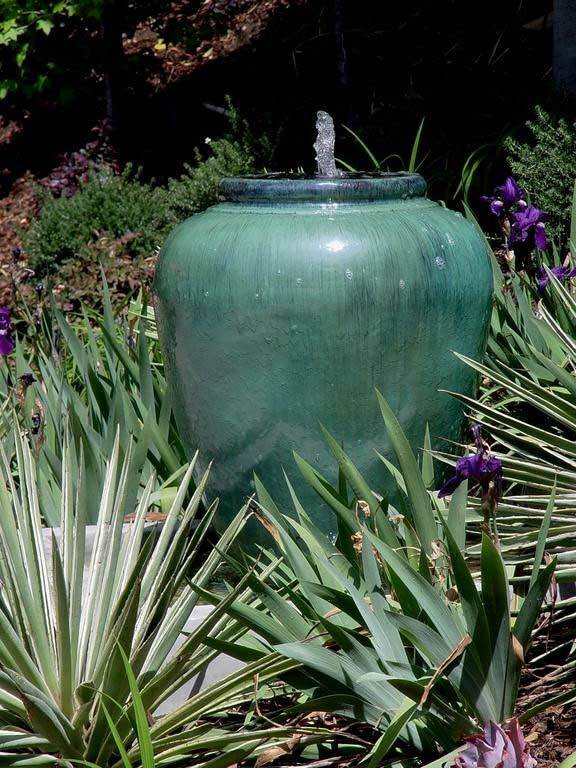 This ceramic vase may appear expensive, but it’s actually one of the cheapest ways to add a water feature to any size garden. All you need is the vase, water source and a recirculating pump. 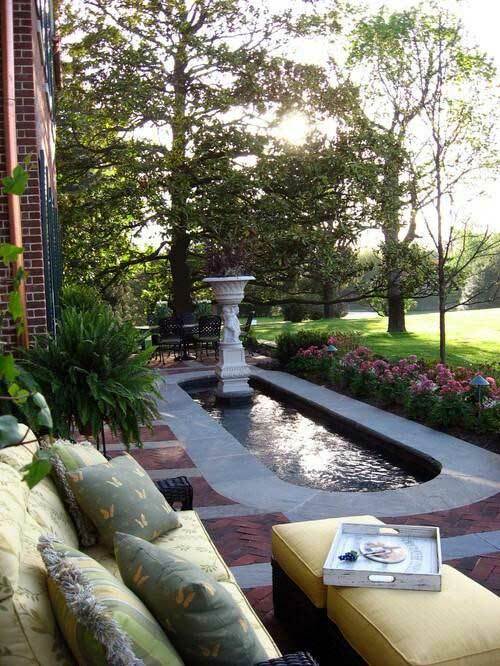 Find a garden area where you’d like to highlight plants, add the fountain and an adjacent chair. The flowing water turns a lackluster garden into a relaxing getaway. When you walk into this backyard, you almost want to wade right into the pond. The tiling around it can be altered to match any style, both formal and informal. Add the fountain column or not. 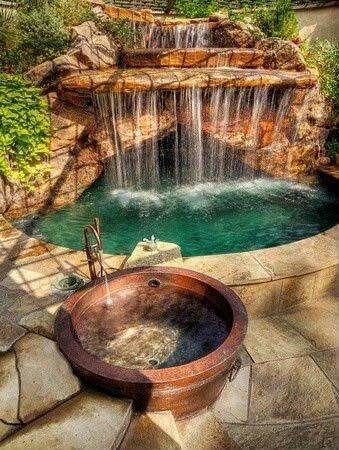 This particular home has a majestic feel so the fountain reflects this perception. Design the circular pond with this extreme oval shape or in a more traditional equilateral form. It’s all up to your imagination. You literally have a stream in your backyard with this rock formation. It’s an intricate rock design, so be sure to hire a strong contractor with waterfalls in their background. The pump must be matched with the land’s slope, pushing water faithfully over the rocks. Pick out your favorite rock colors too. These beige rocks are beauties, but you can also add more dramatic colors, such as granite or solid black. Add this ultimate water feature to your yard and watch everyone flock to your barbecues in the summer. The rock ledge is high enough above the pond to create a substantial waterfall sound, but without the deafening effect of Niagara Falls. This decorator added in a basin alongside the water feature, but a fire pit could be more to your liking. Explore different ideas with a contractor before deciding on the final installation. Do you miss the rain on those long, sunny summer days? 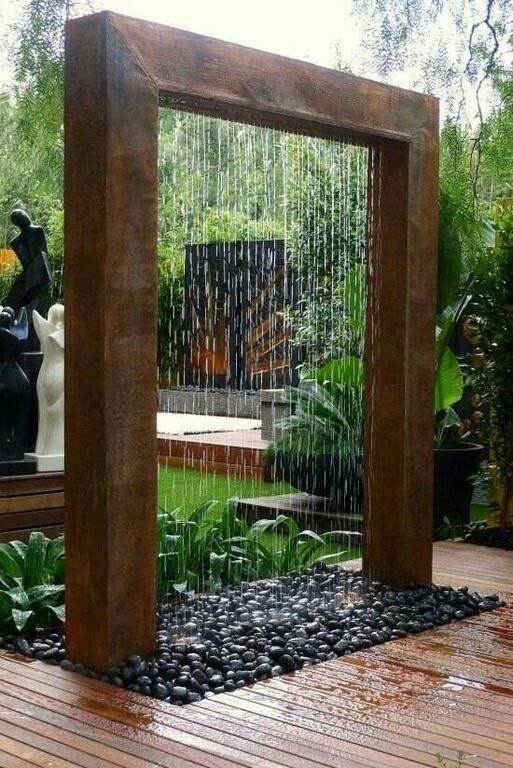 Install this rainmaker to complete a Zen-like garden. The wood frame allows recirculated water to run through small holes along the topside, creating a sheet of calming rainfall. This decorator used basic rocks below for filtering. Also, incorporate a way to recycle the water below the rocks. You’ll have a yard-cooling mechanism while conserving water simultaneously. Locate the rainfall outside the living room or bedroom for the best effect. Looking for more outdoor living inspiration, ideas and tips? Thanks to Tim Smith for this idea filled post. Hopefully, you have gained some inspiration from these backyard pond and water feature ideas for use in your own back yard. What water feature do you have in your yard? Are you installing one now? If so, please feel free to share your ideas with us. Thanks for sharing all of these different water feature ideas! My husband and I have been trying to figure out how to spruce up our backyard, but I think that adding a small water feature with some rocks would be an awesome idea! Plus, using the rocks can help make it look a lot more natural! The soothing sound of water in the backyard really improves the atmosphere of the garden.